I wrote a post a few years ago called 5 Creative Habits You Can Steal for Innovation, the ideas in the article are still solid. Clear your headspace, have intentional influences, capture consistently, externalize and collaborate and go wild. There’s value in mapping out the process of capturing ideas. Awareness allows for seeing gaps in thinking and make new connections. Having a map of how you operate allows you to remap the process and revisit the concepts later. I’ve had my handful of magic moments resulting in a team high fiving or executives staring in awe as I flipped their known world on it’s head and described a break through. I love those moments. My job is often to create, be creative and ultimately lead products that are commercialized. Writing something down means you can look at it and ask new questions. The process and habits for capturing and working out ideas is simple: Input, Time, Output or inspiration, creating, sharing. What we really want is insight which comes from turning an idea over. By looking at this process in different ways we are prompted to ask different questions. Like how do I filter out ideas, what happens if I increase my inspiration, how does the process I have create a bottleneck? 1. Input: Make room for inspiration. Inspiration feels like being on the side of the road as an armoured car drives by, fresh from a successful bank heist. 100 dollar bills spill into the air. Ideas are the hundred dollar bills flipping rapidly in little circles while falling sporadically. In response you are left grabbing wildly with excitement. • Be aware, I’m always ready to capture ideas. • I keep a notebook (I’m a notebook geek). • Making time for walks, especially if I have lots of work! • I keep a journal and make to do list daily, again keeping the headspace clear. • Reading daily from industries other than my own. After capturing inspiration and the excitement fades… that’s when the real work of creating starts. 2. Time: Make time to work ideas out. “Work ideas out” is a perfect phrase because you need to do work to get the idea out of your head and into a shareable and solid form. Rarely are our ideas fully formed. Ideas are more like seeds. Ideas in the head are not complete, they are the potential.Once they are out of your head you can start to refine them and craft them. • Start with morning ritual. • Own the first two hours of my day. • Daily ritual of coffee, journaling, reading, walking and thinking time. • Hold of checking email and news. • Blocking out time for deep work. As soon as I’m online my attentions and focus are stolen. Email, meetings without agendas and twitter all start popping up. 3. 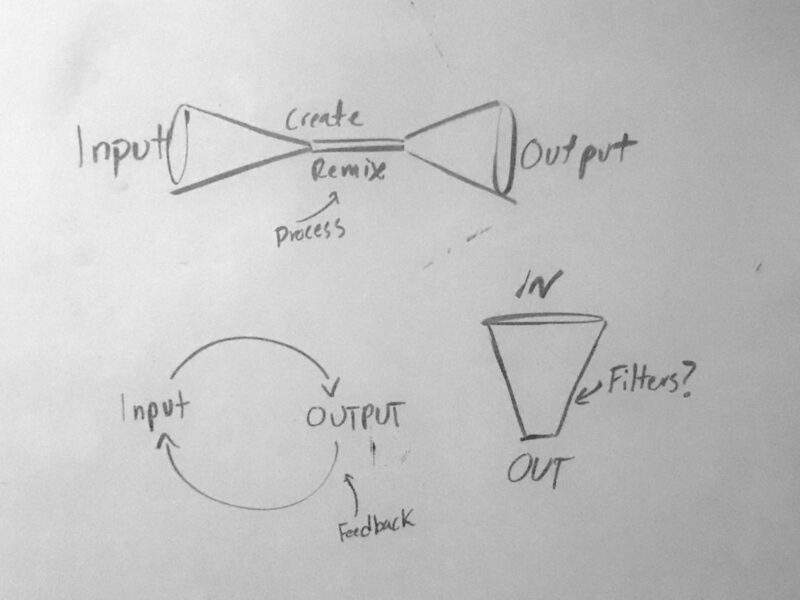 Output: Make more, make public. If you want to learn from what you’re making you have to put it out into the world. Testing what you’re doing gives you feedback. This is true in every arena from art to start ups to sports. Sharing doesn’t have to be with the whole world. It could be your team, or a trusted team member, or good friends. If you’re making products, ideas and inventions and you want to get better, sharing will give you a way to learn. Sharing turns your output into new input. A lot of my day to day work with companies is secret. The nature of innovation in tech is that it gives companies a competitive advantage. While I can’t share peeks at new technology or products, I can share principles and processes and some insight. I can test the principles behind my ideas. If you want to be a powerful force for innovation, persistence will be a much better God than inspiration. Focusing on habits will take you further than focusing on muses. You have to allow for inspiration, do creative work and put that work out into the world so that you can learn, refine, and build more. If you can make a habit of being your process for creating, you’ll have a much better chance at being a powerful and sought-after creative force in any industry you work in.